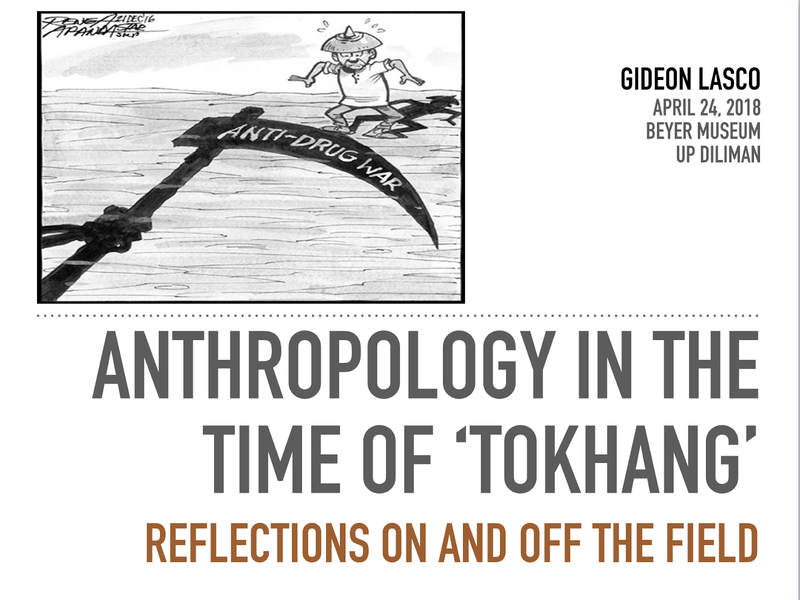 On April 24, 2018, as part of UP Diliman - Department of Anthropology's H. Otley Beyer Museum Talk Series (i.e. the "Beyer talks"), I presented my reflections about what the anthropology of drug use can do both for drug policy and anthropology as a discipline. I drew from ethnographic research I conducted from 2011-2013 as well a recently-concluded follow-up study in a tokhang-affected community. In the talk I emphasised that anthropology can help deconstruct both 'drugs' and addiction', interrogate societal perceptions on drugs as well as government rhetoric, understand the lives of drug users, and identify hidden populations - towards informing drug policies and programs. Thank you to Prof. Edwin Valientes of the Anthropology Department for organising the activity, and to everyone who attended! Hopefully events like this can encourage more academics to pursue an urgent topic in which our voices are crucial, both for the present and the future.